Julie made her quilt to celebrate the arrival of her first grandchild. The design was inspired by the Queen’s Diamond Jubilee and the Olympics, as the baby arrived in 2012. She talks about how she made the quilt and how it has been used, as well as her recent venture into making a jelly roll quilt. Julie later discusses how she uses her quiltmaking as a stress buster, her sewing machine, how quilting is just a part of her sewing time, her family’s appreciation of her quilts and, what she thinks is important in a quilt and quilt heritage collection. Nicky Ryden [NR]: Ok, Julie, would you like to tell me about this quilt you have bought with you today. 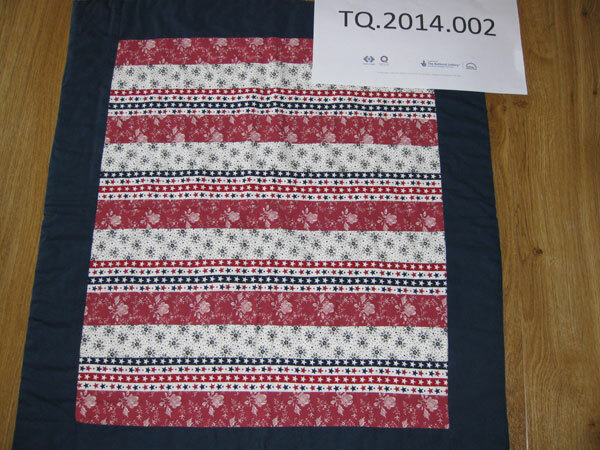 Julie Hollings [JH]: Right this is… well I just call it my red white and blue quilt for obvious reasons. JH: It’s a couple of years old, I was expecting a new grandson, and he was due to be born late 2011, so I knew that he would… he came New Year’s Eve so very late in the end, but I knew that when his mammy went back to work during 2012 we would be having him on a Monday to look after him. And 2012 being Olympic Year, the Queen’s Diamond Jubilee and everything seemed red, white and blue, but I didn’t want to do a flag, and I didn’t want it to just to be so obvious. The navy blue material I had at home already and then I saw the three fat quarters and thought they would work well, it would be as red, white and blue as I wanted it to be. It’s been very well used, and of course he’s almost grown out of it now, but because it’s got flowers on it could be girly, it’s not too gender specific so it served its purpose, it went on him in his travel cot sometimes, when he slept at our house, even now if we were taking him out on a cold day, we would take it to wrap round his legs in a pushchair even though he’s two and he might object. That’s my little quilt. JH: As you can see its very simple, my head works in a very logical methodical way, so stripe, stripe, stripe, repeat, stripe, stripe, stripe! [Laughter] I’ve since learned how to do jelly rolls, and my teacher had to cut them in lengths for me because I just wanted to put, to do it row, row, row, and she said ‘No, no that’s not what you are intended to do’, so I said ‘well I’ll do it one and a half then’, but she said ‘no, it’s not going to be one and a half, it’s got to be random’ and she had to do the cutting because my head is just very measured and methodical, I’m not very random at all but I like the pattern that it falls on, I like the routine of it. NR: You mentioned a jelly roll there, what is a jelly roll? JH: I have subsequently learned that a jelly roll is a roll of fabric about two and a half inches wide and each one would be the width of the fabric, maybe 44 to 45 inches and you would get forty different ones on a roll. JH: And I have used a jelly roll for something else, but I’m kind of a bit averse to them, because I need a bit of control over what I’m making and there’s not much control, you get this lovely roll of fabrics, rolled up in a piece about 8 inches wide, like in a wheel, and you can look at it and see all the colours and think ‘Oh that’s going to be amazing’ and you roll it out and I’m kind of at a bit of a loss then. JH: I like the routine of knowing what’s comes next, I’m not very creative in that way, I’m much more creative in saying ‘OK that will be there and that will be there’, and I know that will look nice, and don’t ask me to shake it up a bit [laughter]. NR: Thank you that’s great! And why did you choose this quilt? JH: Because I made this when I was starting to think about quilting properly, I’ve only been doing it a couple of years. I have a friend who retired and joined the Quilters’ Guild, she said ‘when you retire I’m going to join you in the Quilters Guild’ and she was really enthusiastic about it and I thought ‘I’m sure I could do that’, and I hadn’t ever done it formally before, I’d done it as part of ordinary sewing and house making things but this was the first time I had gone somewhere that sold fat quarters, and I had to ask what they were, and so it was probably my first one since I’d been think about quilting seriously. NR: And you found out what a fat quarter was? 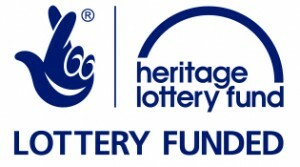 JH: I did, I can’t always remember and then I when see fat eights and things, I think ‘oh no it’s a whole language’ [laughter] And kind of have say to people, ‘yeah, fat quarter, but exactly how many of those would I need to do this? Don’t just sell me three if I need six’. I need to know what the finished product will be. NR: What do you think people might think, looking at your quilt, what might they think about you, what conclusions might they draw about you, from it, do you think? [Cough] I suppose it’s what message do you think this says about you? JH: I’ve never asked anybody actually but you may or may not agree when I tell you what I think. I think anybody looking at it would say that it’s very uncomplicated, it’s very… I suppose predictable, in terms of the colours, it’s not adventurous, I suppose that is what I think. Having seen so many other fantastic things that I’ve seen people do, I think that is probably what it would look like, but again it probably just sums up, a bit straight forward, it’s something done and completed. NR: I’d agree with you about it being straightforward, but I think the colour choices you have made are quite unusual and very pleasing because I think they tone beautifully. JH: Yes, during 2012 there was an awful lot of doing the Union flag in different colours, like pastels and things like that, and when I saw that later on in the year when I’d done this, I still thought, ‘no, I like my red, white and blue’, because the white is not quite white, and the blue is not traditional royal blue, and I like the fact that it’s not traditional but it always tells me its red, white and blue and that was my original intention. It still fits that brief. NR: Good, so you’ve told me how you use it, have you got any plans for it? JH: I’m hoping for more grandchildren, [laughter] I can’t plan that… it’s just big enough for a travel cot for a wee baby, its big enough to wrap round little legs in a pushchair, its big enough to go on a car seat on a long journey, but my youngest one has grown out of it now so I have to wait to see if I get more grandchild, but it doesn’t take up much space so it doesn’t owe me anything. NR: That’s our first quadrant completed, so the next one is your involvement in quilt making, and it starts off with, tell me about your interest in quilt making. JH: I mentioned earlier that I have a friend who retired earlier than she wanted to really, and she and I had worked together, but didn’t at that time and she was concerned that she wouldn’t be busy, and then she joined the Quilters’ Guild and a local quilting group and quickly became very active with that a well as other things. So she was kind of a role model for me, when I retired, I would have time to do all these things. And I’ve always enjoyed sewing, but while I was working full-time I didn’t have the opportunity to do dress making or curtains and things but I’d always loved doing them when I were younger, but quilting I could pick up and do a bit and put it down, there was no time pressure. The seasons wouldn’t pass and that summer dress would be pointless. So my resurrection with quilting was just a couple of years ago with a view to, this is something I could really enjoy when I retire and get into it and not just be making something to throw over a bed, be a bit more creative with it I think. NR: How many hours a week do you quilt do you think? JH: It can be [pause] on a really… I don’t know whether this is a good week or a bad week. On a bad week when the stress levels are extremely high I could do twenty hours [laughter] cos it’s like a stress buster, but then if the weather’s nice and I’m out gardening I might not do anything for a couple of weeks, so it would average out I suppose about 4 or 5 hours a week. That would be acceptable, that would be a nice week were I’m enjoying doing it for no other reason, it’s not a panic mode, get that machine out and get some stress busted, [laughs] yes, maybe 4 or 5 on average. NR: I think you mentioned that you’d done a bit before, but did anyone in your family quilt? JH: No, I was taught dress making when I was little, I mean, really little, I remember sitting, I was seven or eight, and my mother made all of mine and me sister’s clothes when we were little, and curtains, she was a proper tailoress, dressmaker, home furnishings, everything she could do, still could if her hands would work enough, but she never did anything intricate, patchwork wise, nothing of that nature. I hadn’t realised that my sister still had a quilt that I made for her 15 years ago and I only made that as a gift to her because I’d been somewhere and picked up a bag of patches, and it was the first time I’d ever seen patches cut out, and it was a bag of patches with ivory background and pink roses and various, what I would now know as a family of materials, so it would have big roses, and little roses and no roses and all that, and I had bought it quite cheaply at a Craft Fair somewhere, and then made it up into a big piece and then thought ‘what do I do now with it?’ And someone had introduced me to this really strange white wadding that you could make a snowman outfit out of, and I thought ‘Oh! That’s what was you use that for’. So I had this simple piece of white wadding and this simple piece of white sheeting on the back, and then in the middle of the plain white squares I bought some little roses and sewed them on, and its only, I would say six month ago, cos I made her a quilt runner for her silver wedding, and she said ‘Oh I’ve still got that one you made me before’ and I’d no idea she’d still got it because I didn’t think that much about it when it were made. She does an awful lot of looking after my grandchildren, more than I do and she said ‘Ruby absolutely adores your quilt’ and I didn’t know my little granddaughter knew it were my quilt. I didn’t know my sister still had it, so nobody in the family quilts but they are appreciating it and I didn’t realise how much my sister appreciated that piece I’d done for her. NR: It’s great when you get that feedback, isn’t it? JH: Yes, because she’s not a creative person at all in that way and it wasn’t meant as a heritage piece, that you’d say ‘this is a treasured item, you’ve no idea how much work went into it’, nothing like that, I just gave it her as a gift and I didn’t realise how much she treasured it really. 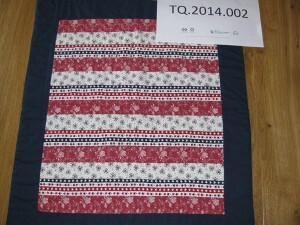 NR: Do you have a first quilt memory? NR: It’s an interesting memory. JH: I can remember when I were little, much littler, watching Waltons, but not with any intent of, you know ,when I get married I’m going to get twelve people round a table and we’ll make a quilt [laughter] because I didn’t think that would ever happen. JH: Yes, my daughter-in-law is a very, very modern young woman, not like anybody in our family, very tall, very elegant, all my family are just short and ordinary and she isn’t, and I’ve always been quite nervous that I wouldn’t make anything to give to her for her house, because she likes very modern things and she buys from shops that I would never dream of going in, so last Christmas I made for my grandson and for my granddaughter a quilt to have at my house, because I didn’t want their mummy to be offended by suggesting I would put it in their bedrooms at home. Don’t get me wrong she’s a lovely girl, I don’t want to make her sound pretentious, but she is not, but when I gave them to them, straight away they both wrapped themselves up in their quilt, and she got her camera out and started taking photographs and she said, ‘Julie, they are absolutely fantastic, look how they are loving them, when I change William’s bedroom will you make a quilt for him for me’. I said, ‘Oh Kim I’d be delighted but I wouldn’t like to suggest… they take a lot of work, I wouldn’t want you to have something you didn’t like.’ She said ‘these are absolutely beautiful, it might be a year before I change his bedroom but would you make him one?’ and I said I absolutely would. And then she was happy to take home the little one that Ruby had got, she didn’t want to leave hers at Grandma’s house, so she took hers home. William leaves it with me and now when Ruby sees that quilt I made for William, and William whose only two and a half, and the first few words that he strung together were ‘Mama made it’. I haven’t said that to him, but his mummy must have said ‘Look after that because grandma made it’. And now anywhere he sees a quilt, at me sisters house, at anywhere, ‘Mama made it’. I’m already on with the quilt for his bedroom, I’ve shown her the pattern from a workshop I went to and yes she liked it, and I said what kind of colours and she said ‘Julie I just trust you, I’ll do the room around whatever you make for him’. That were really nice, it were such a surprise that she did appreciate the work that had gone into it and liked the look of them and it didn’t always have to be really modern stuff. That’s a nice family thing, for the next generation, ‘Mama made it’. NR: That is lovely, really lovely! What do you like best about quilting? What’s pleasing about it? JH: I’m quite impatient when I’m creating things, and I think that fact that I see things growing quite quickly, not like knitting. I just get so impatient with knitting, even if I’m just making, like the quilt I’m making for Will’s bedroom, I need twenty squares for that and I’ve done three, but it feels like I’m getting there, straight away I can see that developing, so the satisfaction of moving on quite quickly, because I’m quite an impatient person. I’m a bit butterflyish, I need to be able to put something down and do something else for a couple of weeks and that’s the benefit of it. But I think in all the sewing I’ve ever done the thing that’s good for me about quilting and home furnishings is that they always fit! It’s not like a dress, that might fit for one occasion, but then… a lady at my sewing class went on a cruise and she said ‘oh no, that dress only fit me for the first week, cos, the second week, I’d eaten so much I needed my bigger sizes’ and I thought that’s the thing with dressmaking you quite easily go wrong with it can’t you? But quilts always fit, it doesn’t matter whether they’re just mini ones like this or a huge one, they are going to fit [laughter]. NR: You have talked about quilt making being a stress buster, but has it ever been a way of helping you through really difficult times? JH: I said to Hazel Williams, I’ve just been to a workshop last week with Hazel Williams and I’d been buying things and I sent her an email confirming I was going and I said she has no idea how quilting has helped me through this last year. I’ve had a horrendous year, the Queen would be proud of the year that I’ve had this year. And yet at the end of it we’re all still here, but it’s been so stressful and, I think I said before, if I’ve had a really bad week I just leave the machine out on the dining table and I don’t care if the house is in a mess because I have to come away from the situation, and put the thread in and go, and in the last week alone, as well as the workshop I’ve been to, a seven hour workshop, I’ve also made two pram quilts and two toys to go with the pram quilts, and that’s how prolific I can be when I need to cut myself off. Because I have to concentrate on it, so I can’t think about anything else, it’s almost soporific, it just takes everything else away. So if I get to a point where I’m feeling tired and I come away from the sewing machine and I’m still stressed, I go back again and do something that doesn’t matter quite as much so I won’t spoil it. It has just been such a blessing this year, to lose myself in it, and even the one little pram quilt that I made this week, I wanted to take it to show my mum but she was in such a bad mood, I didn’t want this little pram quilt to absorb any of that and I kept it away from mum until yesterday when she was in a better mood. When I got there yesterday, she was in a better mood and I took it in a showed it to her and she was so pleased with it. It‘s like there’s that much love goes into them, it’s like the good they do for me has got to go on within them, if you get my drift. I don’t want them to be sullied by anything unpleasant, because they are not unpleasant to me, there are all things that are doing me good and keeping me going. The fact that this little one feels that this is precious and the fact that me sister is benefitting from it as well, there is a spin off, it’s contagious almost, the fact that it’s doing me good, it makes me feel as though the love I put into them it is going on, so if that helps someone to keep their stress levels down as well that’s an added bonus as well. NR: That is good, that is really lovely! Changing the focus a little bit, are there any aspects of quilt making that you do not enjoy? JH: I suppose the usual things, like the size of it, if you’ve got huge ones that you are towing about with, that’s a bit of a pain, and I’ve not yet done a workshop on free motion quilting so I get bit frustrated that at the moment I can just dig in the ditch or do simple things. Maybe because I’m not seeking out things that would frustrate me, maybe all I’m doing is things I get pleasure from. So at the moment there is not a lot that frustrates me. Other than the cost of it sometimes, you get carried away. NR: Do you belong to any groups, quilting groups? 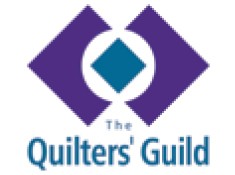 JH: I belong to the Quilters Guild, but I’m not a member of a quilting group, I go to a sewing class, a general sewing class, so I can be quilting in there, but at the same time somebody could be making a roller blind or a skirt, or anything else, it’s just a general class. I go to workshops and things, especially if I’ve seen a pattern I would like to do, so I do workshops as well usually with Hazel Williams because she is in a location that is easy for me to get to, but not any other groups than that. NR: OK… favourite techniques or materials? JH: Cotton, I haven’t ventured with anything other than straightforward cotton, I’m liking, I suppose that’s the thing, I like the one I’ve done most recently. I’m liking the one I’m learning this week, at the workshop, a pin wheel charm quilt, and I like that, particularly because it’s not going in a straight line, so the way that Hazel’s done it, she’s making the patch but she’s sending it off centre so when you look at the finished quilt she’s done, the pin wheels look as if they’re moving, as if there’s motion in there, instead of being in straight lines. So this is me being quite adventurous, instead of doing straight lines but I’m being adventurous with permission, so I suppose that’s as out of control as I can get [laughs]. It will come! NR: Technology… have… the questions as stated is, have advances in technology influenced your work and if so how? JH: Well, my forty year old sewing machine died in January, I can’t tell you how devastated I was because this sewing machine, it had been given to me for my 18th birthday, it had been given to my sister three years before for her 18th birthday and she had never used it, that’s how much she hated sewing, so I’d got that for my 18th birthday. And after Christmas when I’d got so many things to do, and turned on the machine, the foot pedal blew up. I took it to several places and no they couldn’t find a foot pedal to match this thing. I just was devastated. But then me friend, whose a quilter had said ‘if you’re buying a new machine look for a this or a this or a this. That’s what people would recommend and will do everything that you need’. And I went to sewing machine shop and this chap introduced me to one of these machines and then said, ‘I will give you part exchange for yours’, so I didn’t feel like I were abandoning it then, I didn’t feel so bad. So I took this huge heavy iron sewing machine in and kind of patted it, and left with this lightweight one which is just amazing. I absolutely love it, and not that you need it for quilting, but the automatic buttonholes just blow my mind. I want everything to have a buttonhole on it just because I can! But my old sewing machine used to have little cams on, that you used to have to flip a switch at the top, and put the cam in for your embroidery, so I always had embroidery stitches, but this one you just press the button, put the number in and the machine goes away with it. I’m loving it. I never thought that I would disregard my lovely sewing machine as quickly as I did, but once I got this one I kind of thought, and it’s a Pfaff so I can say I will be faffing about. And I straight away did myself a sample sheet of all the things it could do and just absolutely love it, and that as much technology… I’ve seen ladies at sewing classes with things that do handwriting and all sorts of things, this is fine for me, I don’t feel quite disrespectful to me old one, because this is just an updated version of that, so I love how easy it is, lightweight and just blissful. NR: Have you ever used any computer based design programmes? JH: No, another thing, I don’t suppose its technology but I did a workshop using freezer paper and it just blew my mind the things you can do with freezer paper, so that was another thing. And then I had to go online and buy freezer paper, and a couple of ladies at classes when we were making Christmas gifts and little things that you need to cut out time and time again, I’m saying, ‘no, no don’t pin a pattern on, use your freezer paper!’ It’s just little things like that that are so easy. And the cutters, things like rotary cutters, and things like that you know, that I used to, and when I were younger everything I made had to be a pair of scissors that had to be really sharp. And I use me rotary cutter to cut out bias binding if I’m doing dressmaking, so rotary cutters aren’t just for quilting, everything can be used for something else. It’s not technology in its purist sense but it’s advances for me in equipment, shall we say rather than technology. NR: Do you have a dedicated workspace that you work in? JH: No, I tried, when I got the new sewing machine, I tried two or three locations in different places in our house and it was either too dark, or too cold or too away from things, not high enough, none of it worked like the dining room table. That’s unfortunate cos it’s in the middle of the house and it’s an open plan house but it my house and my sewing and if has to stay out, it has to stay out. And that is where I can be most productive, it’s comfortable, it’s got the right light coming in, I’m near enough to the electrical sockets, plus the bonus of the dining table is I can have the ironing board out behind and the overlocker out on the other side of the table should it be required, and I don’t have to do overlocking one day, sewing another day, ironing another day, so I can be quite…. NR: [inaudible] of this Julie is that the dining room will have to be your studio. JH: Yes, the dining room is my studio and apart from which my husband and I live together, nobody else lives in that house, it doesn’t matter, it’s not as if we’ve constantly got streams of visitors that I have to put it away. If people are coming I know they are coming generally and I would put it away if required but equally it’s not offensive, it’s not like I’m stuffing animals, so if anybody came to the house and I’m sewing hey ho, it’s no biggy, is it? NR: That’s an interesting thought. JH: I was just thinking back to what I said earlier. NR: Do you use a design wall? NR: We’ll leave that one then [laughter]. JH: I don’t think I know what a design wall is, I don’t have one. NR: Do you feel that you design your quilts? JH: No, I generally have a pattern and I follow it strictly, [laughs] I’m not very adventurous, I was the same when I tried knitting, I would have a pattern, and if the pattern was, I used to do punchcard knitting on a knitting machine, and if the pattern was in five shades of blue I would buy the same five shades of blue. I didn’t have enough imagination to do anything else. So generally speaking I would take a pattern, I would take a bit of advice on colour choices, but then I would follow that quite rigorously, I’m not experimental. NR: And where do you get your patterns from? JH: Usually if I see somebody’s doing a workshop and it would be technique that I haven’t used before that I would be interested in doing, then I would look at that pattern and think, ‘yes, that is pleasing, I will do that workshop and learn how to do that’. But again if I saw something that didn’t interest me, the pattern, it wouldn’t be ‘well it’s a workshop I’ve got to do it’, it has to be something that pleases me and attracts me. Sometimes I see things in magazines, but I don’t often buy magazines, but it might be the quilting magazine that comes periodically. They’re doing a mystery quilt for next year for the AGM, and I like that because that sets a challenge of like, this month do a row this size just with squares, do a row this size that has got a quarter corner in it, a quarter circle in the corner and I haven’t done that before, so I like that. I need a bit of prescription, a bit of pointing in a direction then I can go away with it, but I don’t generally design things myself. NR: I think you’ve already said about the time you spend quilting and how it’s driven, but is there anything else you want to say about how you balance your time on that? JH: Well I do have a lot of projects that I do, I do dress making and I do home furnishings. I do quilting, it’s not the only thing that I do. I’m quite good at saying well you know, that quilt I’m doing for William’s room, doesn’t need to be finished until the end of the year, I’ve done three squares, I’ve another seventeen to do, but I don’t have to finish them this week. Whereas there’s a baby due and it will need a pram quilt so that needs doing. I’m quite good at juggling my time and equally if I put my sewing machine away for a week I don’t feel bad about it. I’m going on holiday next week, and it’s not as if I’m away and while I’m away I’ve got to go an look at quilts, I can turn myself off from it [laughs]. NR: And how much do you think you spend on quilting each year? JH: I thought about that question, because if you add in the workshops, and the workshops can be £25 up to £40 a time and I maybe do 3 or 4 of them, so at least £100 would be spent on workshops. And that doesn’t add in the amount of fabric that you buy, but I am quite disciplined and I’ve thought about the quilts I made in the last year and the material was bought specifically for a project. And because I’m quite new I’m not at the point yet where I go somewhere and can’t resist buying, so I’m not accumulating a lot of fabric. And I think I probably spent about £400 in the last year. But they have been on specific things I was giving as gifts, so the value of the gift is much higher than I would otherwise have spent on that person, but it is justified in that I’m not stockpiling quilts at home that are not having anything done with them. They are going for a specific purpose, but I think I probably spent about £400 pounds in the last year. I don’t begrudge a penny of it actually, it’s all money well spent. JH: I’m okay to carry on if you are. NR: Oh yes, I am… This next section is talking about quilts generally, and aspects of craftsmanship and design and what is pleasing and maybe doesn’t please you. Do you have any thoughts about what makes a great quilt? JH: I would say, and this is probably very simple, but I would say a great quilt has to cover you up and keep you warm, that’s a very basic quilt. It’s not an artistic one, it’s just a very basic functional quilt, that’s the word, functional, for me a quilt has to be functional, warm, cosy, comforting, does its job and washable, thinking about the children that I’ve used them for it always has to be washable. NR: So whether it’s artistic or not, perhaps you wouldn’t be so concerned about? JH: It would need to be pleasing for me to look at, but the person I would be giving it to would be under it generally. I’m not generally making it for people who are that bothered what it looks like, other than such as my daughter-in-law, who’d specifically said she would like something that she would build the bedroom decoration round it, so the appearance will be important for her. So the appearance, it just needs to be something that is pleasing to me as I’m making it. And looking at quilts, I would need to look at something… the same as any art that I might look at I don’t want to have it explained to me, I want it to be quite obvious what it is, I’ve got very simple tastes. NR: So something that speaks to you. JH: I don’t need to, I’m not happy if I look at something and I have to look at the description on the wall to say what’s that? You know like Barbara Hepworth and its things like ‘Tree Reclining’ and I think ‘What? Where’s the tree and it’s not lying’. That kind of art I don’t appreciate. if I look at something and the colours are pleasing and the shape is pleasing and it’s not jarring and things don’t clash to harshly, then that is pleasing to me and that’s as artistic as I would need it to be I think. NR: What do you think would make a quilt that was going to be displayed in a museum or special collection, what qualities do you think that quilt might have? JH: Well obviously there would be a title for the collection, so if you’d got a title that was American Quilts, you’d be expecting to see traditional type of patterns and material to be used. I’ve been to exhibitions by quilters groups and there’s just everything in there and I don’t think it has to be one thing or another. You can see a king-sized bed quilt that is just done in an amazing manner, they hang up and you look at them and think ‘how earth could anyone possibly manage that?’ Physically manage that size of thing! And then in the corner will be a pincushion and that just as pleasing as a quilted item or one of these pieces that folds up and it ends up like a little block but it’s got all your sewing requirements inside, and I think that’s just as amazing as the huge piece on display. I don’t think it has to be anything particular to go into an exhibition as long as it goes with the theme. But for me and I guess with anyone else with art its personal taste, you would look at something and think ‘oh gosh, I don’t know about that.’ But mostly, when I have gone to amateur exhibitions they have all been really impressive and amazing to think that just ordinary people are doing tats, these are not people who are getting paid for it, they are just doing for the love and pleasure. NR: There is some wonderful talent. JH: Oh amazing, absolutely amazing, yes. NR: …and what about a museum, if you were going to a museum what do you think would make a quilt appropriate for a museum. JH: If it had some resonance with history, so let’s say the miners’ strike, which is history now, it didn’t feel like that when we were going through it, but if you had pieces that people made during the miners’ strike and you had a collection of them and you could see that the fabrics that were used were relevant to that time or [pause] again the American quilts that were made out of old shirts or of old denims, that original usage of quilts then they would be relevant for museums. Or particular works that somebody has done, they’ve developed a new techniques that would inspire other people, you would look at that and think ‘gosh I didn’t know that you could even do that’, so that would be worthwhile going into a museum I would guess, but it’s not, I have been to a quilt exhibition, and it wasn’t at the Quilt Museum oddly enough, I think it might have been at York Art Gallery, but they were American quilts and I always thought of quilts as being American, I didn’t think of them being an English thing, very much. NR: What do you think makes a great quiltmaker? JH: Passion and the love of it really, I think it’s just that. The people that I’ve meet that do quilting in the short time I’ve been doing it, people that I learn most from are people who just love it, they want to share with you what they know and what they got out of it and nobody’s pretentious about it, and they are quite happy to tell you how to do this right. Nobody’s saying I can do mitred corners really well and I don’t want her to know how to do it, nobody’s precious about it. They will say if you do this, ‘shall I show you how I do my mitred corners?’ and you just think that is so generous, because it’s such a difficult thing to do and once someone has shown you a technique, you just think, that’s amazing that it can be that simple and most of the people that I have meet are just like that, they are all just really passionate about it, they love what they are doing and want to do more of it and share it with other people and take it to the next generation almost. I think that what makes people great at anything, isn’t it really, the passion of it. JH: I don’t know enough names of people, I went to a regional day in, maybe, I don’t know whether it was this year or last year, it might have been Spring or might of been November time, I’m not sure and a lady came there, and she had done things, all these kind of amazing Indian colours really, really, and sort of Moroccan and she’d left all the threads hanging, instead of cutting off the threads when she’d finished doing all her quilting, she left them hanging and I loved that, I loved that technique. And then when I went to an exhibition a couple of weeks ago one of the pieces in the challenge had done that same technique and I met the lady who done that piece and I said ‘is that like we saw at the regional day?’ and she said ‘No, I’d already done this and when I saw hers’. I was kind thinking I can do that leaving them hanging. So it wasn’t that she was the first to do it, but she was the first one I saw, who was demonstrating that, other people were doing it, but I was impressed by it. I don’t know enough other quilters to say I like this person or that. JH: No, well Hazel Williams, she’s my ‘go to’ teacher. NR: We all need somebody like that. What do you feel about machine quilting or hand quilting? JH: Hand quilting would not be fast enough for me, absolutely not. I have done a Dresden Plate pattern, I did that twice and that’s when I used to be working in London, so I had long journeys on a train, you can’t take sewing on a plane because you might stab somebody with a needle, [laugh] but on a train you can get away with it oddly enough! So on long journeys from Wakefield to London I did two Dresden Plate patterns although they were, to be strict they were patchwork rather than quilting, then they were put on top of something which made them into a quilted piece. But hand sewing generally is just way too slow for me. It’s got to be quick and getting on with it. NR: And what about longarm quilting? What do you think about that? JH: Never seen a longarm machine in person, in real life. I know ladies who I was absolutely shocked when they told me they do the sewing and then pay somebody enormous amounts of money to quilt their pieces, I had no idea that happened, and then when people were saying about longarm quilting machines, I can see now why they would pay that amount of money because it’s so much easier than the way I do it. But I don’t think I would ever go down that route, I think that I would like everything I make to be completely mine. I don’t know whether there’s places where you could go and do a longarm quilt day, and spend a day using somebody else’s longarm machine. NR: It would be good if you could, I don’t know whether you can or not. JH: It doesn’t really appeal to me I think I’m quite happy to stick with what I have got. NR: The final section is about the function and meaning of quilts. And the first question is why is quilt making important to your life? NR: I think you have said quite a lot about that, but I don’t know if there’s anything else you want to add? JH: It’s just a creative outlet for me, but the main thing that it does is it makes things that have got me in them, that I can share with other people, which dressmaking and soft furnishings don’t do that, it just a personal thing for sewing, but quilting is generally something I’m making to give away. NR: Do you think your quilts reflect your community or the region in any way? JH: No definitely not, the region I live in is an ex mining area and it doesn’t feel very creative at all, I’ve got friends who are creative, but generally speaking we are not a creative community. JH: I think that when the miners’ strike had finished and our pit closed anyway, I think our town lost its direction for a long time, it’s started to reinvent itself but it’s coming back almost like a commuter town, people can get to elsewhere for work and live there, so I don’t think it’s got much of a sense of community where I live, the other places where I go to go to quilt exhibitions and things like that I can see that is much more relevant there, but it is a bit more rural perhaps than where I live. NR: So where would that be? JH: The ones I’ve been to have been at Bawtry, a fantastic exhibition at Bawtry, then Boston Spa, and over Huddersfield, and I know Huddersfield is a city or a town, but its like the little outlying areas around Huddersfield that feel more rural and maybe there a tradition that goes back longer than where I live. NR: That’s really interesting. So if you think about quilts and British life, what do you think are the importance of quilts in British life? JH: [Pause] I’m not aware of a great history of quilts in British life. I think of quilts very much as we are picking up a tradition that American people have handed down, and certainly in my family’s history, I know my mother when she was little, they did rag rugs and things like that, that is more of a mining type thing but I’ve never been brought up with people that would do quilting, so it’s not something I’d thought of as a traditional British thing. It feels like it’s something like Halloween that we have inherited from America [laughter]. That we are embracing with vigour [laughter]. NR: Do you think quilts have a special meaning for women’s history in Britain? JH: I wouldn’t think so, I may be wrong, but I wouldn’t not in Britain, in America, yes. NR: OK… and how do you think quilts can be used? JH: Well, I’m seeing more experimental ways of using quilts than I had previously thought, I just thought of throwing them on a bed or keeping somebody warm and I can see the attraction, particularly for somebody like me who likes doing things quite quickly, I can see the attraction of doing an A4 sized piece that you can hang on a wall. So the use is much more wide than I had previously thought, and I’ve gone to workshops to make spectacle cases and purses and things, which I haven’t thought of before, so I guess there’s any number of ways that they can be used but my mind’s not creative enough to think about them, I can take on an idea that somebody else has given me. But I don’t think things up generally on my own. NR: Well that might come, as you go on, as you get more confident. JH: Dog coats or something… [Laughter]. NR: I think you mentioned what happened to the quilts that you make for family and friends, you have found that people are still loving them and cherishing them, enjoying them which is really nice. 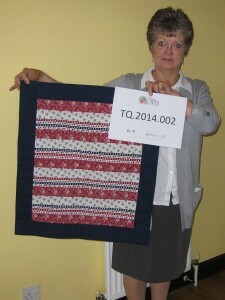 So the final question is what do you think is the biggest challenge facing quilting today? JH: For me… I would say access to fabric, I always feel I have to travel a long way to find to a nice range of fabric, and I’m fortunate, if I’m doing a workshop the lady that runs them usually has a pop up shop that you buy things from, but other than that it seem like a real trek to go and find anything. And maybe that will come back, when I was younger you used to buy fabric on the market, any little village and town would have them, and they don’t now so maybe access to material would be the biggest challenge. In my experience which isn’t wide, maybe access to equipment. Like this longarm thing, maybe that’s an idea we need to be pursuing [phone rings], get people to buy a longarm and then rent it out at a longarm workshop. I suppose it’s not a challenge it’s just something you want to build in, if you know you’re going to be doing something, you have to think ahead, know when you’re going to an exhibition or somewhere you can buy the fabric. NR: Thank you very much Julie.